Our range of products include flexible rubber union connector. 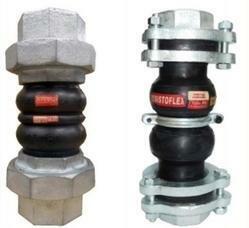 Flexible Rubber Union Connector present alignment, thermal expansion and noise & vibration transmission problems resulting in prestressed pipelines susceptible to premature failures. Highly flexible joints with screwed ends alleviate these stresses. Building / HVAC / Plumbing types of equipment, piping systems for industrial plants &private residences. Looking for “Flexible Rubber Union Connector”?